A couple of months ago I visited Mark’s Deli in Giffnock, south of Glasgow. It’s apparently the only Kosher deli/caterer in Scotland. I’m not Jewish but I’ve long been a devotee of Rabbi Lionel Blue and his wise musings about food and life. And furthermore, I’d just visited some ladies at the Jewish Day Care Centre, and been charmed by their liveliness, curiosity and humanity. Especially when one lady, aged about 90, hung back after lunch and told me she’d spent a year in Auschwitz. ‘We were very lucky, my mother and me,’ she told me, ‘we were only there for a year before we were liberated.’ So that’s luck, is it? I must reassess my life. Anyway, the least I could do after that was have a look at their local deli, and it was very interesting. My ideal deli has exotic hams and sausages hanging from the rafters, and shelves full of exciting tins and bottles and packets, a reeking cheese stall, a huge fresh veg area with oddities like samphire, and some wonderful breads. Think Valvona and Crolla’s and you’re right there. But Mark’s wasn’t a bit like that. There was a bit of fresh, lots of frozen, and various packets and tins. Not a feast for the eyes, but apparently his outside catering is something special. Undeterred I bought a frozen chicken (! Exciting !) jointed into eight, and some smoked aubergine pate, and pickled herring, and a few other bits and pieces, and enjoyed them all over the following week. But the other day I was rummaging in the cupboard and found a packet of Matzo Ball Mix, which I’d quite forgotten about. Matzo Ball Mix! What on earth possessed me? I suppose Lionel Blue must have waxed lyrical at some stage. And tonight I was cooking some chicken pieces and veggies, and looking for rice to put in as a one-pot meal, and discovered I’d run out of rice. So I thought maybe I’d made it brothy and add some noodles. And then, broth in mind, I remembered the Matzo Ball Mix. Reader, here it is. 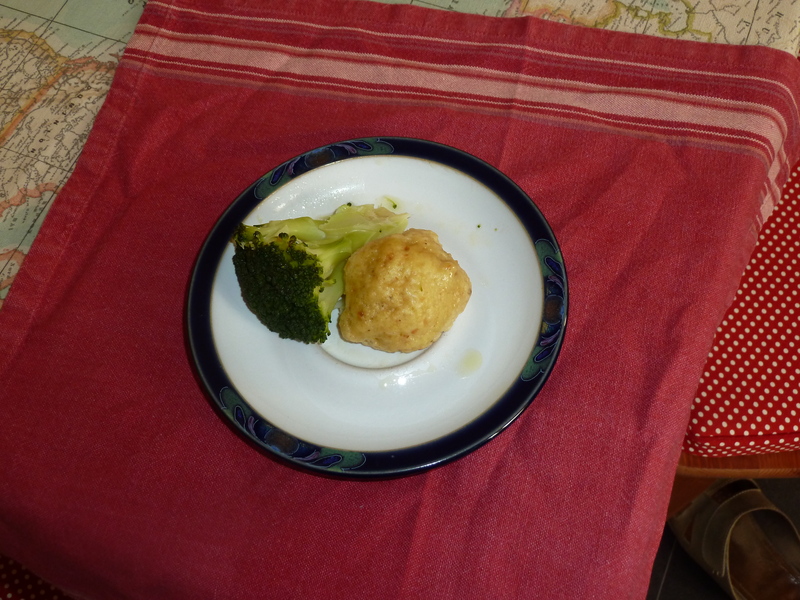 The finished Matzo Ball, posing artistically beside a bit of broccoli. Yes, I quite liked it. Will I make them again? Maybe not. But I might review some dumpling recipes and adopt them as part of my occasional repertoire. There’s something comforting about dumplings, so long as they’re light and tasty (but I’ve had my share of dull and heavy in the past). The Matzo Mix required two eggs and quarter of a cup of vegetable oil (I used Scottish rapeseed) and they were fine but would have been improved with a bit of fresh parsley. Matzo is made of Passover Wheat Flour. In the past I’ve made dumplings with breadcrumbs and suet, parsley and lemon zest, crossing my fingers because the word ‘suet’ conjures up horrible notions. However they were light and flavoursome. In any case, I would like to propose a toast: here’s health and happiness to the 90 year olds who recognise luck in its strangest forms and show us how to deal with adversity.